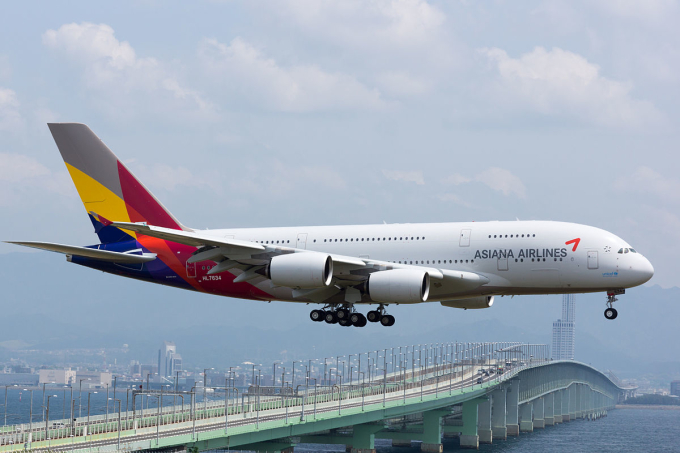 The South Korean Asiana Airlines has temporarily stopped operating six international routes because of the diminished flow of Chinese tourists against the backdrop of diplomatic tensions that arose between Seoul and Beijing after the installation of the THAAD anti-missile system, according to Pulse by Maeil Business News Korea that cites corporate and industry sources. The temporary cancellation of international flights is connected with the need of the airline, which suffered most from the drop in the numbers of Chinese passengers, to compensate for the financial losses. The airline’s revenues coming from the Chinese market consisted 19.5% of total revenue, which is 11% more than in other airlines. Asiana Airlines is the second largest South Korean air carrier. “We need to revise our routes to compensate for the damage. After the peak of the summer season passes, we intend to reduce our workload and use this time for aircraft maintenance,” one of the airline’s managers told Pulse. Sources in the industry told the publication that the number of flights to Hong Kong, Singapore and Bangkok will be reduced. Temporary cancellations will affect flights to Astana, Saipan and Palau. In March 2017, it became known that the Chinese government instructed Beijing’s travel agencies to stop the sale of travel packages to South Korea. These actions were taken in response to the deployment in South Korea of the THAAD air defense system due to the intensification of of missile exercises by North Korea.